1 Can I Store Biscuit Dough Overnight? 2 Can You Cook Biscuits on the Stove? 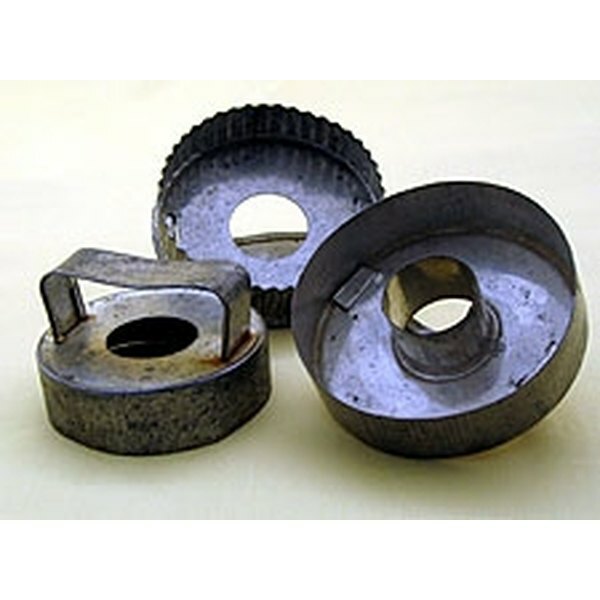 A biscuit cutter is a kitchen tool used to cut biscuit dough into even shapes. A biscuit cutter is similar to a cookie cutter, except that you use it to cut biscuit dough instead of cookie dough. The biscuit cutter was invented in 1875 by Alexander P. Ashbourne, an African-American inventor and dry goods grocer from Oakland, California. Biscuit cutters can be made out of both metal and plastic. They are generally round. Their sides can be either straight or fluted. The purpose of the biscuit cutter is to ensure that each biscuit from a batch is the same size. This helps ensure that the biscuits will cook evenly. If biscuits are different sizes, they may cook at different rates, resulting in a batch where some biscuits are overcooked and some are overdone. Some biscuit cutters come in decorative shapes, like hearts or stars. To prevent biscuit dough from sticking to the sides of your biscuit cutter, dip it in flour before you cut. The biscuit dates back to Roman times. Its name means "twice-cooked" in Latin. The American biscuit is different from the British biscuit -- in Britain, "biscuit" means a cracker or cookie, while in America, a biscuit is a quick bread made using either yeast, baking soda or baking powder. The American biscuit emerged in the 1800s and was especially popular in the South. Cooks would mix their biscuits and then roll and shape them by hand. In 1875, Alexander P. Ashbourne patented the first biscuit cutter. It consisted of a board to roll the biscuits out on, which was hinged to a metal plate with various biscuit cutter shapes mounted to it. After you rolled the biscuits out, you brought the plate down on the dough, creating many biscuit shapes at once. The cutters were spring-loaded, allowing the biscuit shapes to be easily released. The biscuit cutter also came with a space to store your rolling pin. Today, biscuit cutters are much simpler -- perhaps because biscuits are less common, and we make them in smaller quantities. After the Civil War, many African-Americans entrepreneurs entered the food industry. Emancipation meant that African-Americans could move to different regions, pursue higher education, and start businesses. Many African-Americans started catering businesses or became grocers. They also created many food-related inventions. Besides Ashbourne's biscuit cutter, African-American inventors of the 1870s, 1880s, and 1890s also patented bread-making machines, the ice-cream scoop, dough-kneaders, lemon-squeezers, the lunch pail, the refrigerator, the corn silker and the egg beater. Cookie cutters are a good substitute for a biscuit cutter, although it's important to use the simplest cookie cutter shapes possible. You can cut biscuits into detailed shapes, but that detail will be lost once the biscuits have cooked. This is because biscuits rise so much during baking. Empty, clean tomato paste cans can also be used. These will result in small, round biscuits. In addition to inventing the biscuit cutter, Ashbourne also patented processes for treating and refining coconut oil. What is a Biscuit Cutter? Does Baking Dough Kill Bacteria? What Is a Baking Wire Rack?